Isn’t it kind of funny how every time a season changes, a year ends, a month ends, school ends or school starts everybody always says “Wow I can’t believe it’s already ____”? It’s not a rare thing for it to seem as though time just flew right past us, yet we always are surprised by it. Instead of being surprised, realize how fast time passes and focus on this moment, these people and these things that you have in your life right now; they will come and go quicker than you may think. I think watching time fly past is a sign that we need to slow down and live today instead of always working for tomorrow. I graduate college this December, yet it feels like I just left high school yesterday. I have known my college friends for three years already, which is hard to believe. After this December I am moving to Hawaii for eight months before starting culinary school. It is going to be the experience of a lifetime; but who knows if I will ever see many of these friends in the next stage in my life. Knowing this, I am trying to spend as much time with them as possible this fall and really live my last college moments to their fullest. Of course, along with this comes lots of good food! I made this particular recipe for some of my best guy friends the other night. One of the best comments I heard while eating was, “This is the most healthy and delicious thing I have eaten in a long time!” I think that pretty much sums this dish up, plus it is a great way to make use of those giant mutant zucchinis in your garden! 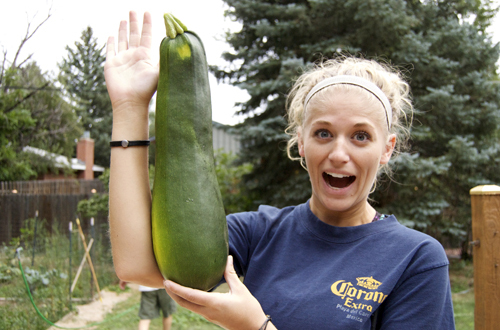 My roommate, Kelcey, with one of the many giant zucchinis from our garden! Grease a glass casserole dish and preheat the oven to 350F. 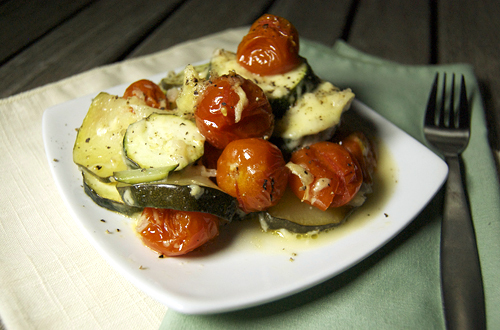 Toss the zucchini slices with 1 tbsp olive oil and half of the salt, pepper and garlic. Layer half of the zucchini slices, half of the tomatoes, then half of the cheese. Repeat until all ingredients are layered. Bake at 350F until veggies are soft (about 30 minutes). LOL on the zucchini..wow it is really big! :))) your roommate almost look too scared! :) On the other hand your meal is so delicious looking..love your photos!! Ha! That always happens in my garden! There’s always that one zucchini that gets missed, drinks too much, and almost walks off, lol! 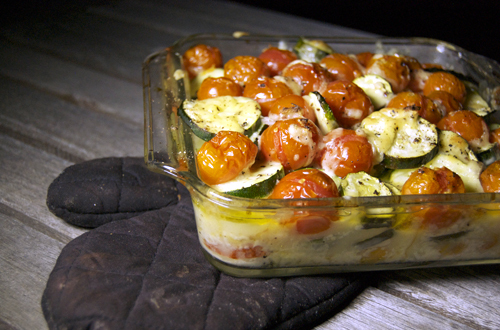 Love your fresh zucchini and tomato gratin. A simple and perfect way to eat those delicious garden veggies! Looks just like my mountain top garden. We took the top off from a mountain to build and we have challenges. Cherry tomatoes and zucchine are staples around here. Dish would be so easy after working outside all day! Thanks for keeping it simple. Most time when I hear “gratin” I think of gooey, fat-laden dishes that drown out whatever veggies are in the dish. On the other hand, this recipe sounds perfect. A good mixture of vegetables, some cheese…healthy and delicious! No THAT’s a zucchini!! Culinary school AND Hawaii? You have fun times ahead, congrats! This looks SO good and it’s a much healthier alternative to potato gratin!! It looks so fresh and hearty! Holy Zucchini! That could make so many great things! This gratin looks gorgeous with all those tomatoes too! OMG that zucchini is huuuuuge!! This looks like yummy way to get your veggies in for sure! That is a huge zucchini…but the gratin is a feast for the eyes! That looks very tasty and very healthy! Looks delicious!! And that is the biggest zucchini I have ever seen! !